If you or your loved ones have suffered injuries in a crash involving a semi truck, big rig, bus, or 18 wheeler truck, our hearts truly go out to you. Our experienced semi truck accident law firm is here to guide you and toward the justice and compensation you deserve. Crashes involving large trucks are often the most catastrophic injury cases we handle. A fully loaded semi truck (also called a big rig or tractor-trailer), extending up to 80 feet in length and weighing up to 40 tons, can cause destruction and injury to anything it hits. 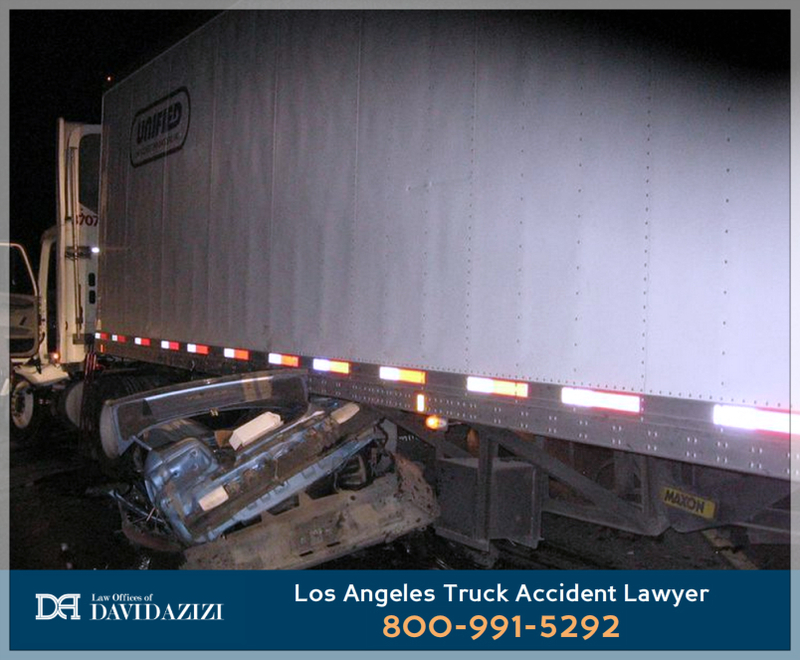 For 21 years, Los Angeles-area semi truck accident victims have found lawyer David Azizi to be exactly who they needed to represent them in these complicated truck crash cases. He has a 98 percent success rate with personal injury and wrongful death cases, winning for harmed clients the financial compensation from the parties responsible for their injuries. 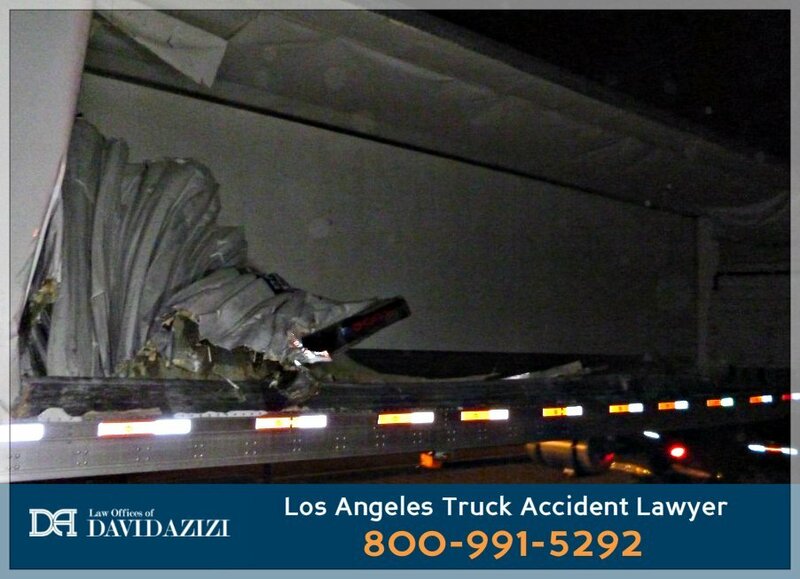 If you need immediate help in the aftermath of an accident involving a semi truck, please call the Law Offices of David Azizi day or night at 800-991-5292. We are here to get you justice in this difficult time. What Is A Semi Truck? trailer – the rear portion of the vehicle, often with a container that gets attached to hold the cargo and pull the load. With some semi-trucks, a fifth wheel hitch is used to attached the tractor portion of the vehicle to the trailer. California semi truck accidents can be extremely difficult and the recovery process can cost victims not only complicated injuries, but extensive loss of work, and an ongoing battle with pain and suffering. Not all victims feels comfortable filing a lawsuit or fighting for a settlement, but when your life has been dramatically harmed in a semi truck accident, you deserve justice and to be made whole in the eyes of the law through financial compensation known as money damages in the the court system. Losing the use of your vehicle after an accident usually feels like an added blow. The semi truck crash team David leads knows that accidents with large trucks and commercial vehicles often leave a car undrivable, requiring extensive repairs, and in many cases, a total loss. That means the vehicle will need replacement. In some cases, personal property in your vehicle gets destroyed as well. When we make our demands on your behalf from the trucking companies, the damages we seek always include the immensely valuable resource of a personal vehicle. Our investigators will help to determine the market value of your car when a replacement becomes necessary. Functioning without reliable transportation in California is not realistic. Our clients will often require a rental vehicle, an expense that climbs each day. We fight to make sure these expenses are included in the amount we demand for you from the truckers. It’s very common for our injured clients to miss a significant amount of work as they recover from a semi truck crash. Rest assured, there is a positive path forward. The semi truck accident claim we pursue for you includes lost income and wages. Self-employed victims are also protected under California law, and when someone else acts negligently and you get hurt, we can normally recover the income you would have earned. In this video below, David discusses how his client’s SUV was hit from behind by a semi truck. The accident was even more severe because the force of the truck pushed the SUV into another 18 wheeler in front of it, crushing the vehicle between the two tractor trailers. Settlement amounts vary based on the unique details of each case. The semi truck crash injury calculator can give you a rough estimate of what financial compensation for your claim might look like. If you’re ready to discuss a more accurate picture of your unique case, call us 24/7 at 800-991-5292 for a thorough and free case review. We will quickly connect you with David who will patiently answer your questions and evaluate the strengths of your case. Knowing your next steps after an accident with a large truck or commercial vehicle is crucial. Truck crash attorney David Azizi answers the most commonly submitted semi truck crash questions in this podcast episode. Play the episode below. David’s experience over two decades as a semi truck accident attorney means he knows how to get results with giant trucking companies who seek to avoid payouts. He not only requires the companies to produce the log sheets that can prove driver fatigue, but he also subpoenas all data from EOBRs (Electronic On-board Recorders), made by Qualcomm and other corporations. Similar to “black boxes” found on airplanes, these record readings related to driver and vehicle performance. Who Is At Fault After a Collision With A Semi Truck? In order for justice to be restored when you’ve been wronged, determining fault after a crash with a large commercial vehicle becomes essential. In many cases we see, the trucker and/or trucking company holds nearly all responsibility for the collision and your injuries. When you’ve been in an accident and it’s not your fault, we will work to prove the trucker’s liability and to calculate and fight for the amount of money damages owed to you. Think you might be partially at fault for the semi truck wreck? Even when you might have contributed to the cause of the crash leading to your injuries, our clients have a path forward. California adheres to the practice of “Pure Comparative Negligence.” This means that even when a judge or jury determines that you are partly at fault, you can still pursue a financial recovery with the understand that your final award of compensation will be reduced by the percentage you were at fault. If you were in a wreck with a semi truck and the total damages awarded to you are $100,000,000, but you were also 10 percent at fault, you’d receive $90,0000 (the amount awarded minus 10 percent for your portion of fault). Bottom line, do not let partial fault in a semi truck crash keep you from taking legal action. Even if you think you played a major role in a crash with an semi truck or big rig, these cases often involve millions of dollars and your recovery could still be substantial. The very top priority for you after an accident with a semi truck is always safety and your needed medical attention. Our team is ready to assist with gathering hospital records and we will encourage you to attend every scheduled doctor visit. This is for your own legal protection so that the trucking companies can never suggest that your injuries are not really that significant. Sending a Letter of Representation – This is our first course of action to notify the trucking companies that there is a dispute that exists and that you now have an experienced lawyer who will be a professional advocate for you in these legal matters. Filing A Legal Complaint – The “complaint” is the very first document that opens your case. When we submit this to the court clerk and deliver it to the defense, they know we mean business. It will explain the evidence we have, the extent of your injuries, a designation that they are responsible (known as “liability”) and a demand for justice and financial compensation (called “damages”). Receiving An Answer From The Trucker – After we file our complaint to start the case, the defense will make their first move, giving an official “answer” to your claims of wrongdoing. If they admit liability and agree to you financial demands, we’ll negotiate the final details of an out of court settlement. Pursuing the lawsuit against the trucker to trial – It’s pretty common in large cases for the trucking company to deny liability and refuse to pay out what you deserve. We are always ready for this scenario, and it’s at this stage that we would officially file a truck accident injury lawsuit on your behalf. This means your case will be headed toward trial where a lawyer will litigate your case, presenting evidence about your collision before a judge or jury to make a decision about the dispute. In some cases, once a lawsuit is filed, the trucker and company might decide to offer a settlement to end the dispute. When a settlement offer is fair and restores justice and provides reasonable compensation, that will end the case and you will get your financial recovery for the accident. But when the offer is not fair, or if a settlement is not offered, we are fully prepared to continue the fight all the way through trial until we get a winning verdict and award from a jury. 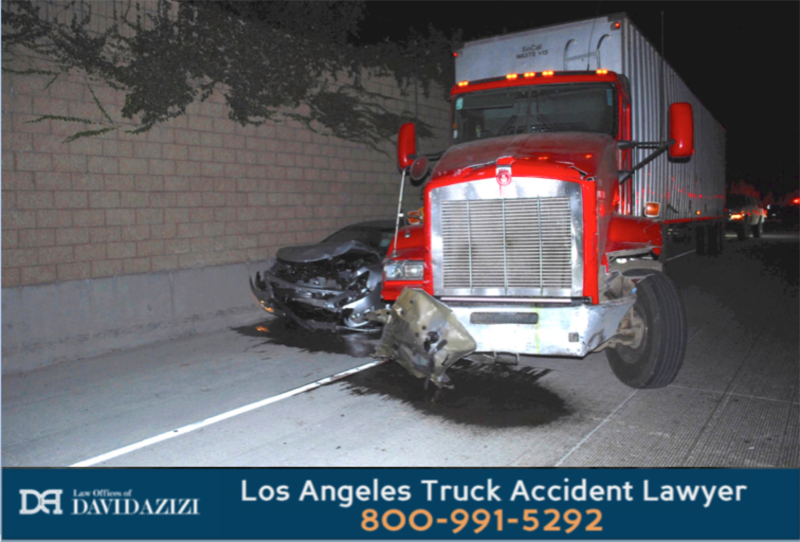 David Azizi and the Los Angeles truck crash legal team wins verdicts and settlements for clients at a 98-percent success rate. On the very rare occasions he does not win, there is no charge to the client. This is known as a contingency fee arrangement, more commonly spelled out as “no win, no fee.” That means we foot the entire bill and only collect a percentage after a victory. The large legal services corporation Avvo rated the Law Offices of David Azizi as “Superb,” and Expertise.com lists David on their Top 20 Personal Injury Lawyers in Los Angeles. Super Lawyers also recently recognized him as a top L.A.-area attorney for the sixth time. David and team know how giant trucking corporations and insurers work. Many years ago, he himself worked in the insurance industry – the “dark side,” as David calls it – and he studied the many strategies these companies use to eliminate or reduce the settlements they pay to injured victims. He has aligned himself with the pursuit of justice so that big trucking companies know their responsibilities are made to pay in order to make you whole in the eyes of the law. Time is of the essence in these cases because of the statute of limitations, that all important deadline to be able to file a lawsuit and recover money damages. Your next step is telling us your story so that we can hear the details of your case and give it a full and free review. We urge you to call us at 800-991-5292 without delay. Our team is ready get out to the accident scene with our experienced investigators and gather the needed evidence to prove your case. As a married father of three young children, David especially feels it when families are involved on any level. He gives every client his cell phone number because he knows that questions and concerns will come up. Since 1998, David has stood up for injured victims throughout California. If you are ready to begin your journey toward legal and financial recovery, David is ready to spend the time needed to give your case a free evaluation. Call or chat with us today and let’s get you and your loved ones the justice and payout you deserve.